*The day was spent cleaning the house and working in the yard in preparation for our weekend in Moscow for Cosette’s graduation. *I took a trip to Ace Hardware and Yokes and picked up some flowers to plant. 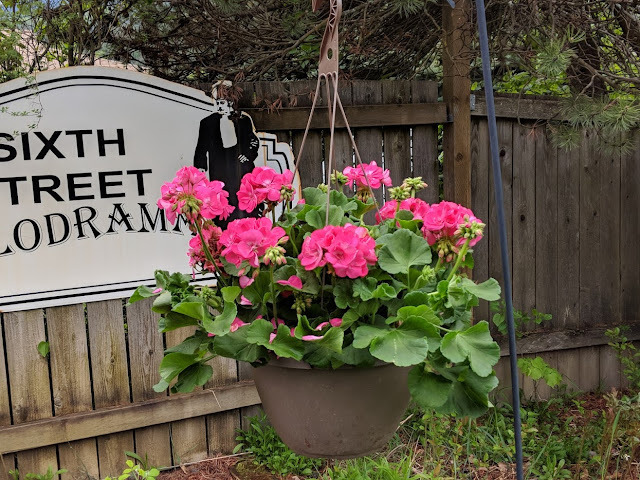 I got another hanging basket, a scented geranium, and some petunias to plant in the flower boxes around the patio posts Paul recently constructed. *After Paul arrived home from school we did some last minute cleaning up, and packed the car and headed to Moscow. We arrived at our friend Jill and Vince Rinaldi’s house around 7 p.m. Christy arrived soon after we did. And then Molly, Travis, Zoe, Cosette and Taylor arrived. Unfortunately Zoe’s boyfriend Jason was not feeling well and stayed back and Molly and Travis’ apartment. We had a wonderful evening catching up with the kids, and Jill and Vince, and had a delicious dinner prepared by Jill.